OshonSoft would like to draw your attention to the new great book on Amazon by Mr. Lal K C based on the PIC Simulator IDE software - PIC MICROCONTROLLERS FOR EVERYONE: Made Easier with PIC SIMULATOR IDE BASIC Compiler and Simulator. Please take a look at the Kindle Edition and Paperback and start learning. 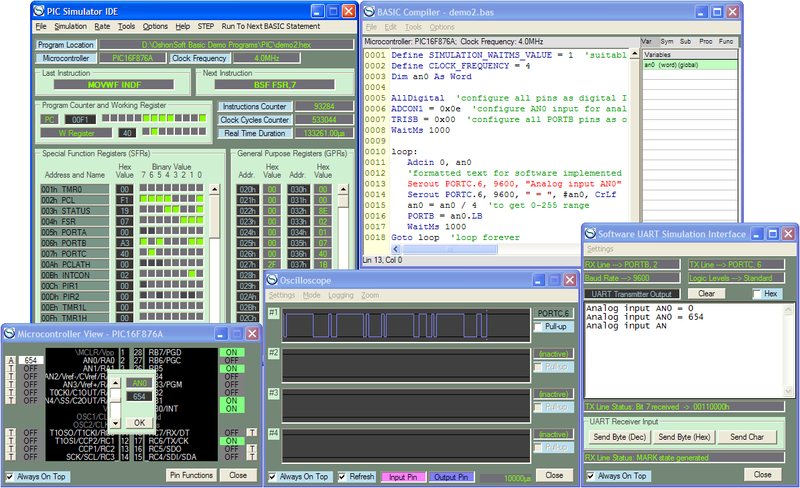 PIC Simulator IDE is powerful application that supplies Microchip microcontroller users with user-friendly graphical development environment for Windows with integrated simulator (emulator), pic basic compiler, assembler, disassembler and debugger. 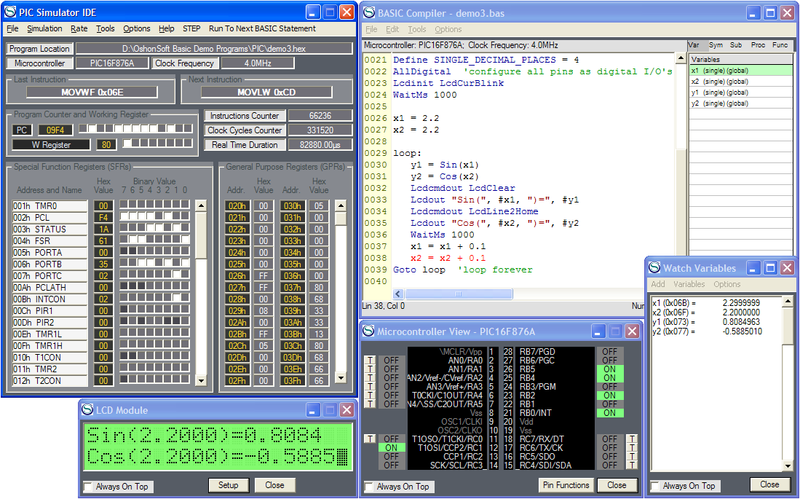 PIC Simulator IDE supports the extensive number of microcontrollers (MCUs) from the Microchip 8-bit PIC Mid-Range architecture product line (selected PIC16F, PIC12F, PIC10F models). You are welcome to download the fully functional evaluation copy of the software on the downloads page. 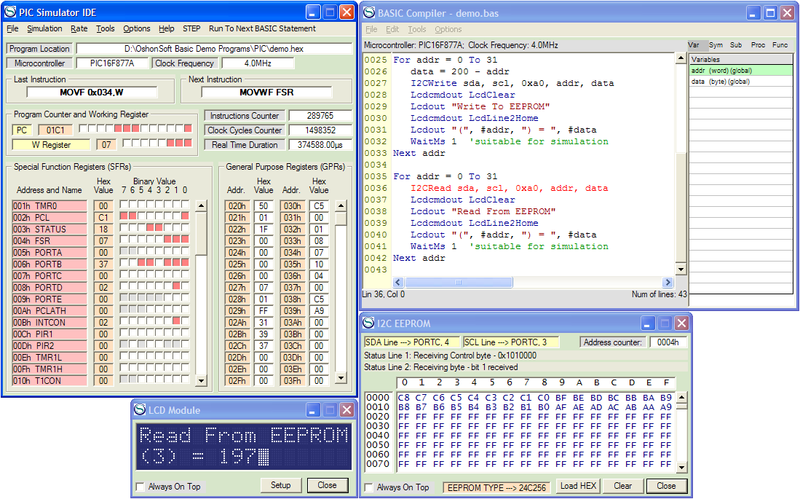 PIC Simulator IDE requires a license to operate after the evaluation period. For more information please visit the licenses page. PIC10F320, PIC10F322, PIC12F609, PIC12F615, PIC12F617, PIC12F629, PIC12F635, PIC12F675, PIC12F683, PIC12F752, PIC16F72, PIC16F73, PIC16F74, PIC16F76, PIC16F77, PIC16F83, PIC16F84, PIC16F84A, PIC16F87, PIC16F88, PIC16F610, PIC16F616, PIC16F627, PIC16F627A, PIC16F628, PIC16F628A, PIC16F630, PIC16F631, PIC16F636, PIC16F639, PIC16F648A, PIC16F676, PIC16F677, PIC16F684, PIC16F685, PIC16F687, PIC16F688, PIC16F689, PIC16F690, PIC16F707, PIC16F716, PIC16F720, PIC16F721, PIC16F722, PIC16F722A, PIC16F723, PIC16F723A, PIC16F724, PIC16F726, PIC16F727, PIC16F737, PIC16F747, PIC16F753, PIC16F767, PIC16F777, PIC16F785, PIC16F818, PIC16F819, PIC16F870, PIC16F871, PIC16F872, PIC16F873, PIC16F873A, PIC16F874, PIC16F874A, PIC16F876, PIC16F876A, PIC16F877, PIC16F877A, PIC16F882, PIC16F883, PIC16F884, PIC16F886, PIC16F887, PIC16F913, PIC16F914, PIC16F916, PIC16F917, PIC16F946.